Let’s walk through a simple options trade. For this walk through, I’m going to use TD Ameritrade. Let’s go to the quote page for the stock we wish to purchase options on. You will see a link to “View Option Chain”. You would click that to see the choices for an options trade on the stock we have chosen (in this example it’s AAPL). You will then be shown the “Options Chain” for AAPL. These are usually grouped in 3 main ways. Whether its a call or put option, by expiration and by whether the options strike price is currently “in the money” or “out of the money“. Let’s look at what these terms mean. What are “calls” and “puts”? You would purchase a “call option” if you believe the underlying stock is going to go up in price and you would purchase a “put option” if you believe the underlying stock would go down in price. One friend of mine says “put it down” and “call it up”. What is an option’s expiration date? The option contract’s expiration date refers to final day that the options contract is valid. When an investor buys an option, the contract gives them the right but not the obligation to buy or sell an asset at a predetermined price, called a strike price, within a given time period, which is on or before the expiration date. Expiration dates are grouped into Weekly, Monthly and Quarterly. Not all stocks offer all three of these expiration types. Monthly expiration dates are the most common. What is a strike price? When I trade options, I view the strike price as the price that I’m betting the stock will reach before the expiration date. Therefore, if I believe AAPL will be at or above 530 on or before November 29th 2013, then I’d purchase a 530 call option with a Nov 29th expiration (this would be a “call” and not a “put” because I believe the price will increase). The price at which a specific derivative contract can be exercised. Strike prices is mostly used to describe stock and index options, in which strike prices are fixed in the contract. For call options, the strike price is where the security can be bought (up to the expiration date), while for put options the strike price is the price at which shares can be sold. What does in-the-money and out-of-the-money mean? This is a simple one. A call option is in-the-money if the strike price is at or below the stock’s current market price and the call option is out-of-the-money if the strike price is above the stock’s current market price. A put option is in-the-money if the strike price is above the stock’s current market price and the put option is out-of-the-money if the strike price at or below the stock’s current market price. In the “options chain” screenshot below you’ll see the in-the-money trades are highlighted. Now, let’s continue with this example options trade with AAPL. Let’s say we believe the price of AAPL will be at or above 520 by the end of the day on Nov 29, 2013. If this case, we going to buy a call option. Therefore we are betting that the price of AAPL will increase from its currently price of $524.72 (its “Last” price in the screenshot below). This is a safer bet than a 525 call, because the trade is already in-the-money at the time of opening it. It’s a little less risk, little less reward. We would buy a 520 call option (the orange “ns” icons mean “not standard”, we’ll ignore them for now.). The 520 call option that expires on Nov 29th is priced at a BID of $6.00 and an ASK of $6.15. Since we are looking to buy this option, for simplicity sake we would pay the ASK. (You could enter a BID at wait to be filled, but that’s a whole other tutorial). 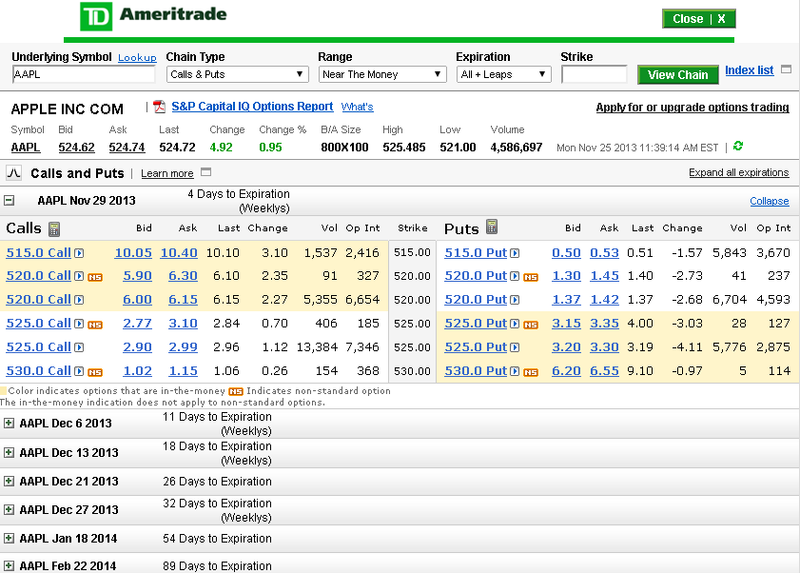 Within TD Ameritrade, you could click the blue arrow next to where it says 520.0 Call > and select “Buy”. Now, let’s continue on to choosing how many contracts. You would then be shown the details of the order you are about to place. Since we are looking to purchase 10 contracts at a price of $6.15, the price would be 10 contracts * 100 (each contract=100 shares of stock) * $6.15 = $6,150. Then, to finalize the order you would click “Place Order”. You’ll see on the review order screen that the selling price of this example trade is $7,000, that would be an $850.00 gain, or about a 14% gain. You did it! You just made your first options trade! That wasn’t that hard was it? You can go here to setup a practice account on TD Ameritrade.